Reiki is a traditional Japanese healing technique wherein the practitioner manipulates the flow of energy in a person’s body to improve their physical, mental and emotional health while also combating stress and tension. Reiki healing is often called "energy work." Reiki is used in many settings, including hospitals, hospice and in self-care. Reiki is both powerful and gentle. It is a safe, non-invasive form of hands on healing. Reiki is used to relieve pain, strengthen the immune system, rebalance the functioning of the organs, eliminate toxins from the body, calm the mind and emotions, aid in concentration, help in the grieving process and generally accelerate the body's own healing process. Reiki is not affiliated with any particular religion or religious practice. Reiki is very safe and gentle and there are no contraindications for using reiki. Reiki improves the results of all other types of healing or medical treatments. It is a wonderful complementary therapy in any healing or wellness program. In cases of chronic or more serious ailments, several sessions are necessary initially and then additional sessions are recommended periodically as the client feels necessary. ​A Reiki session is offered to a fully clothed recipient who is lying on a treatment table or sitting comfortably supported in a chair. The practitioner offers light, non-invasive touch with the hands placed and held on a series of locations on the body. The placement of the hands should never be intrusive, nor should there be any pressure. An entire treatment can also be offered with hands hovering just off the body and be equally as effective. Physical and emotional history will be discussed at the beginning of each session to address areas of concern. Reiki is cumulative and even people who don't notice much the first time usually have progressively deeper experiences if they continue. 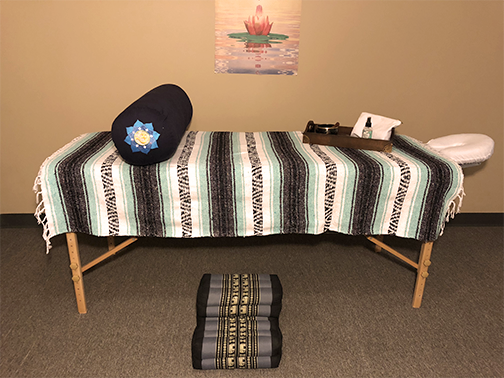 Besides the immediate experience of the Reiki, you may notice other changes that continue to unfold in the days following your treatment: perhaps stronger digestion, a sense of being more centered and poised and less reactive, and sleeping deeply that night.